On the eve of the final mission of the U.S. space shuttle program, most Americans say the United States must be at the forefront of future space exploration. Fifty years after the first American manned space flight, nearly six-in-ten (58%) say it is essential that the United States continue to be a world leader in space exploration; about four-in-ten say this is not essential (38%). Looking back on the shuttle program, a majority (55%) say it has been a good investment for the country. However, this is lower than it was in the 1980s; throughout the early years of the shuttle program, six-in-ten or more said the program was a good investment. 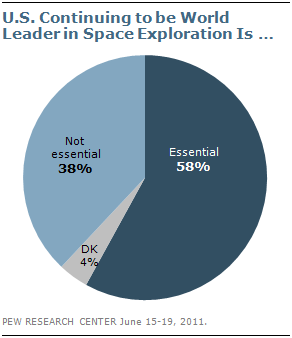 Majorities in nearly all demographic groups say it is essential that the U.S. continue to be at the vanguard of space exploration. And partisan groups largely agree that American leadership is vital, although this view is more prevalent among Republicans. 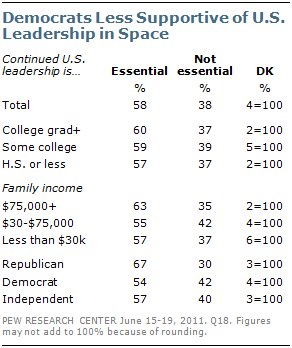 Two-thirds of Republicans (67%) say the nation must continue to play an international leadership role in space exploration; smaller majorities of Democrats (54%) and independents (57%) say this. As the shuttle program comes to a close 30 years after its first mission, 55% of Americans think the program has been a good investment for the country; 36% do not think so. In August 1981, four months after the first shuttle flight, 66% said the program was a good investment. About two-thirds of college graduates (66%) say the shuttle program has been a good investment, as does a smaller majority of those with some college education (57%). Among those with no college experience, assessments of the value of the shuttle program are more mixed: 47% say it has been a good investment, while 43% say it has not. Americans with annual family incomes of $75,000 or more give more positive evaluations to the shuttle program than those with lower incomes. By greater than two-to-one those with higher incomes say the program has been a good investment (67% good vs. 27% not good); those with annual incomes of less than $30,000 are divided in their views (44% good, 47% not good). And while about six-in-ten Republicans (63%) and independents (60%) say the program has been a good investment, Democrats are more muted in their appraisals (48% good investment). Large majorities say that the space program has helped encourage interest in science, led to scientific advances and contributed to feelings of patriotism. But no more than about four-in-ten say that the program has contributed “a lot” in any of these areas. Overall, 39% say it has contributed a lot to encouraging interest in science, 35% say it has contributed some while 22% think it has contributed not much or nothing. Nearly as many (38%) say the space program has contributed a lot to scientific advances that all Americans can use, while 34% think it has done a lot for feelings or pride and patriotism. 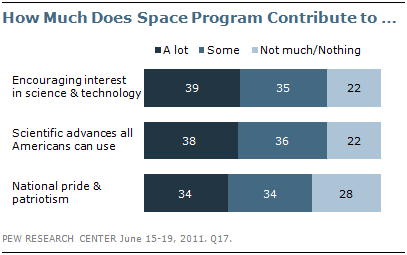 There are only modest political and demographic differences in opinions about the space program’s contributions. More men than women say the program contributes a lot to scientific advances (by 45% to 31%) and encouraging interest in science and technology (44% to 35%). Shuttle Has Been "Good Investment"